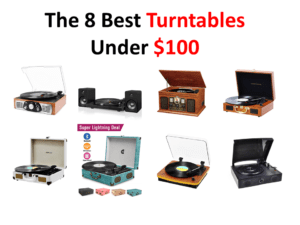 If you are a lover of vinyl like I am you are going to get a real kick out of these turntables under $200 reviews. 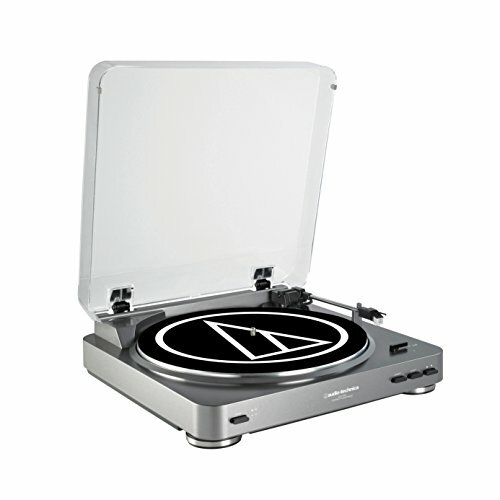 I have been collecting vinyl for a few years now and I was recently given the chance to look at some of the most popular turntables at this price range. These kind of turntables are great if you are looking for something that is that little bit more high quality than you get with a budget price turntable. Look For Bluetooth: While listening to music on vinyl is awesome and for many of us, once we get into the hobby there is no going back. Something still has to be said for the convenience of being able to stream music off our phones. Some turntables will offer Bluetooth connectivity that allows you to connect your phone to it and stream music through the turntable’s speakers. Breaking In The Speakers: Many turntables these days come with speakers built into them. Of course, these are never going to be the best quality speakers, but for most people, they will be fine. One thing I always suggest that people do is not to crank the volume all the way up as soon as they take the turntable out of the box. 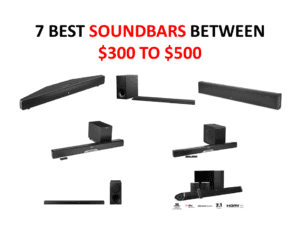 When you are looking at my 8 best turntable reviews under $200, you will notice that I mention breaking the speakers in a few time. If you break speakers in properly they will not just last longer, but sound better as well. Maintenance: Collecting vinyl is a very fun hobby, but there can be a little maintenance that comes with it. First of all, you may have to change the phono cartridge (the needle) some turntables do come with a spare, but these can be picked up fairly cheap so do not worry about it. Also, you will want to try and keep it free from dust so it keeps on working at its best capacity. It is not much maintenance, but it is worth knowing this before you jump in. Over the last couple of months, I have been lucky enough to test out 6 of the best turntables under $200. I will give my honest thoughts on each one and tell you what I liked and did not like. To round these reviews up, I have also picked another two turntables that I did not personally test out, but I feel they are worth looking at a little closer. 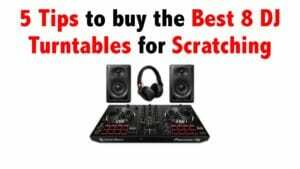 Often seen in the best turntables under $200 guides. 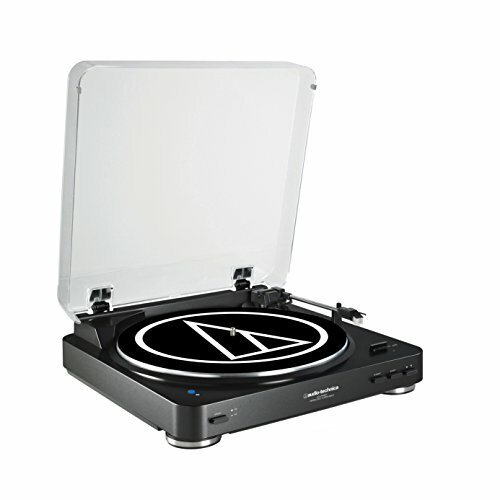 This one from Audio Technica is a fantastic turntable and would serve you well as an upgrade if you currently have a budget priced one. 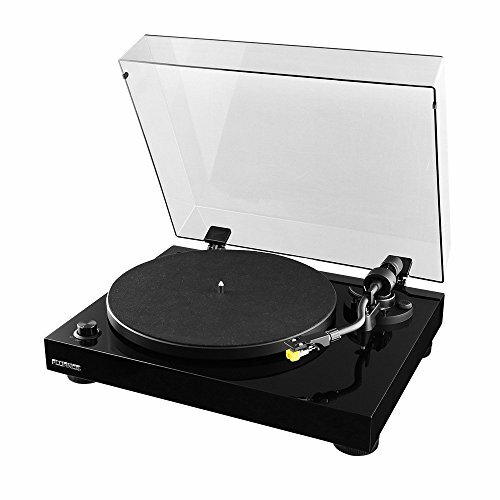 It has a really modern style and I love the jet black design (other colors are available) and the clear plastic lid, which can close all the way to keep your turntable safe from dust. I am sure the modern design will be popular with many of you guys. Bluetooth is what this is all about, it does not come with speakers, but the idea is that you connect it to your own set of Bluetooth speakers, headphones or even a receiver. You can connect it to a set of speakers via RCA cables if you prefer also. I tested this with two sets of Bluetooth speakers, one of which was in a different room and it picked them up no problem at all. It also has an automatic arm which is kind of weird watching it lower onto the vinyl itself, but it works. Sound wise, I was very happy, Audio Technica has put one of their good phono cartridges on this which gives you a really crisp sound. Of course, a large part of the sound you get out of this depends on your speakers, but with the speakers I had, I was very happy with the sound quality of this turntable. I feel it is aimed at those who are not new to vinyl collecting and want something a little higher quality. If you want a turntable that is cool and is going to give you some great sound, have a closer look at this. At around 130 bucks, this is a steal. They have gone for a really classic and classy design with this. The actual base is made of very nice looking wood. It goes great with that clear lid they have used, which can actually close over a record which is a nice touch. If you want a turntable that is going to be pleasing to the eye as well as the ears, you will love this. Setting this up was very easy. Out of the box, it has a set of speakers built in so that you can start listening to your music right away. Three speed settings and a great arm, make playing a record very easy. While this does have speakers, you can use your own thanks to the jacks on the back, which if you have higher quality speakers I would suggest you do. This does have Bluetooth so you can use this to stream music from your phone with things like Spotify and it will play through the speakers. The sound quality out of the built in speakers is not the greatest. However, I feel if you were to take the time to break them in properly, you would be happy with the sound quality. To be honest the sound is not bad at all, but like I said before, I would recommend maybe looking into some higher end speakers if you plan on getting serious about your vinyl. 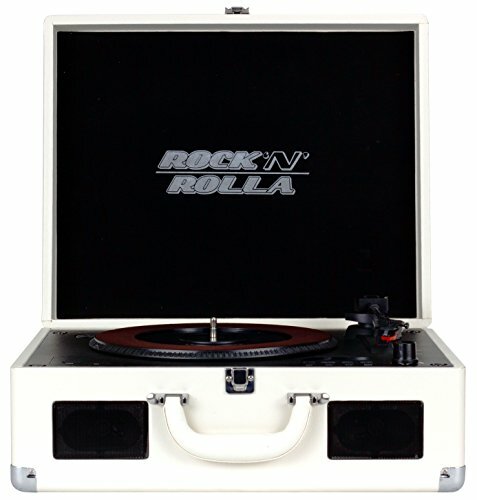 This turntable is ideal if you want something that is ready to rock and roll right out of the box! This is one of the best turntables under $200 and I know the close to 200 bucks price tag is what first catches your eye. But you have to admit, this looks really, really cool! I was very impressed with the weight of this when I took it out of the box and it is quite thick. I love the black gloss look (although finger prints and dust may be an issue down the line) and in general think this turntable just screams high quality when you look at it. There is no Bluetooth connectivity with this turntable and it also does not come with any speakers so you are going to have to make sure that you have your own speakers. Connecting speakers or connecting this to a stereo receiver is not hard at all. While this is clearly aimed at people who have used a turntable before, I do not think a first time turntable owner would find this confusing at all. Sound is what this is all about, the stylus they have used and the whole phono cartridge in general are very high quality. This makes the sound very rich (as long as you have good speakers of course) and I think that things like live albums especially sound incredible when played on this. Actually I spent a few hours listening to some of my favorite live albums such as my prized Iron Maiden live collection and I was amazed at how good it sounded. I know the price is high, but if you are really serious about your vinyl and do not mind also buying a higher end pair of speakers, you cannot go wrong with this. With a really cool design and offering great sound. This turntable is aimed at those of you who want something more high quality. Even has a CD player! Certain colors cost way more! Wow is what you will say when you first see this! I love the classic design that they have given this and it looks like the old turntable my grandparents used to have. If you are a lover of things that have an old school look to them, you will get a huge kick out of this. Out of all the best turntables under $200 I think that this one has the design that most clicks with me. I was sent the mahogany version which is currently being sold for right around 120 bucks. Other colors are available, but the prices vary, even though the insides are the same. Where to start when talking about how you use this thing? This is called 8 in 1 and that is because it is jam packed with features. Of course, you have the turntable at the very top, which is a three speed turntable., However, this also has a CD player, radio, USB port and even Bluetooth connectivity so you can connect your phone to it. I know that we are looking at turntables today, but having all your music equipment in one box is very handy. It makes this ideal for a spare room where you are short on space. Also included with this are built in stereo speakers and even after breaking them in they are not the most amazing quality. Played at the right volume though, vinyl still sounds good though it. Of course you will have to make sure you break them in and do not just turn the volume all the way up out of the box! It does have jacks, so if you have higher quality speakers at home, you can connect it to them. I really like this and for the price, feel that it is a fantastic deal! If you are looking for something more than just a turntable, you have to check this out as it is awesome! Anything that has Mr. Bob Marley’s name on it gets a thumbs up from me! This is one of the most gorgeous looking turntables that I have ever seen. It is actually made from thick bamboo and solid aluminum… well that is what the box says. Being serious though, I love the design of this thing and the bamboo really does give it a high quality feel and look. If a showcase turntable is what you want, you will struggle to beat this. Taking this out of the box and setting it up was very easy. It has no speakers so you will need some, but connecting them was very easy thanks to the jacks on the back. But before I did that, I actually used my new headphones that my wife got me for Christmas as there is a handy headphone jack on the front. It comes with a dust cover to keep dust from getting on your turntable, but I feel a clear lid could have been added, especially as the price is close to 200 bucks. Look, I know it is predicable, but Bob Marley’s Legend was the first album I used and through my headphones it sounded amazing. So crisp and so rich, the stylus they have used on this is amazing and even when I used my speakers, the sound quality was very nice. I like how balanced everything sounded and if you want a turntable that is all about the sound, you will fall in love with this. This turntable is made with bamboo which looks cool and the high quality stylus makes sure the sound is fantastic. The last of the turntables that I got to check out is this really awesomely named Rock N Rolla turntable. It has a suitcase design and it is actually much larger than the pictures suggest, but I really like that. While the version that was sent to me was black, other colors are also available. Where to start with the features? Ok so the actual turntable is really cool and the main reason you are here is that you want to listen to records. However, you can flip it up and there is a hidden compartment that houses a CD player! How awesome is that? As well as playing both vinyl and CD’s, this has a USB slot and thanks to Bluetooth, you can stream music from your phone to this. It has its own stereo speakers, but you can also connect it to a set of speakers or a stereo receiver. One other thing I have to mention is that it also has a little LCD screen which is great for the CD, player. Now this is coming in at right around 120 bucks so keep that in mind. The speakers are not the best, but the sound is certainly not bad at all. It can be a little tinny at higher volumes, but most people are going to be very happy with the sound this produces. Plus you always have the option to connect it to a stereo receiver or a better pair of speakers. If you need a CD player to go along with a turntable, you can get this at an amazing price. 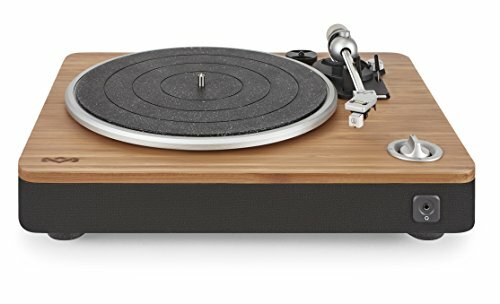 I really wanted to include a turntable that is aimed at someone who is new to the hobby or someone who is looking for a second turntable for a spare room. At a little over 100 bucks, Audio-Technica have done a great job here. While I have not gotten my hands on this one. I do like the style and think it looks pretty cool with its modern yet elegant design. The clear lid not only looks great, it will protect the turntable from dust. Now this is not a Bluetooth turntable and it does not have built in speakers. However it does come with RCA cables so that you can connect it to a set of speakers or a stereo receiver. One thing that I noticed on the pictures and from what customers who have purchased this have said is that these cables are very short, so you might want to make sure that you have some longer ones if you plan on having this more than a few feet away from your receiver. As I have not tested this I cannot say for sure how good the sound is. The reviews seem positive though. Of course a huge part of getting the best sound out of this is all down to the speakers that you have. So if you have a good set of speakers, I am sure you will be happy with the sound that this is pumping out. One nice bonus that this turntable comes with is a cleaning kit. You get a brush to clean the actual turntable and also one to take care of your vinyl records which is a very nice touch. If you are on a budget and still want a cool looking turntable, I suggest you take a closer look at this. The last turntable we are taking a look at often appears on the best turntables under $200 lists. I love the retro design that this has, it looks like it was taken right out of the 1950’s. It has that classic radio look and it would look awesome in a man cave, sitting in the living room or any place in your house really. While I was not lucky enough to get my hands on this, I do think it is worth taking a closer look at. The actual turntable is hidden well by a latch that looks to be very high quality. While vinyl is why you are here, you get more with this. It has a radio and also a CD player which is very cleverly hidden and from the pictures, at first glance you struggle to see it. While it does not have Bluetooth, it does have a port so you can physically connect your phone to it. It has built in speakers as well as a USB port which for some people is very handy. For under 200 bucks, people seem to be very happy with the sound quality that is provides. It is said to have some very nice acoustics and I think the large design is the reason for this. I would really love to give this a try and see for myself. Like most speakers though, you will want to ensure you break them in properly so that they do not sound tinny or distorted. In all this looks to be a great peace of kit and one I hope to test out one day. 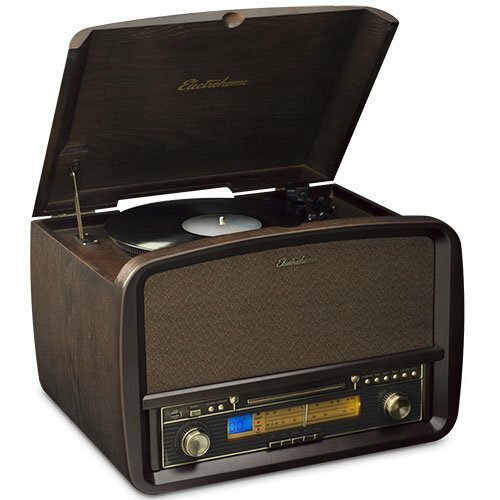 If you want something with a real classic style that offers more than just being a turntable, you have to check this out. Talk about a hard decision! Not one of the six turntables I tested were bad. So picking between them is tough. 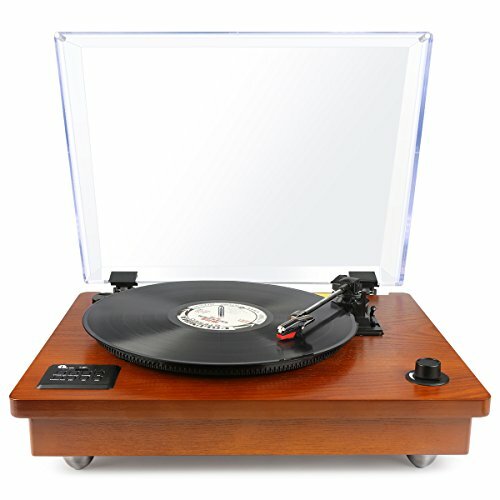 I think that if you want a more higher end turntable and you are all about getting the best sound possible for under $200, you want to take a closer look at the Fluance High Fidelity Vinyl Turntable Record Player with Premium Cartridge and the Audio Technica AT-LP60BK-BT Fully Automatic Bluetooth Wireless Belt-Drive Stereo Turntable. These are both very high end for the price. 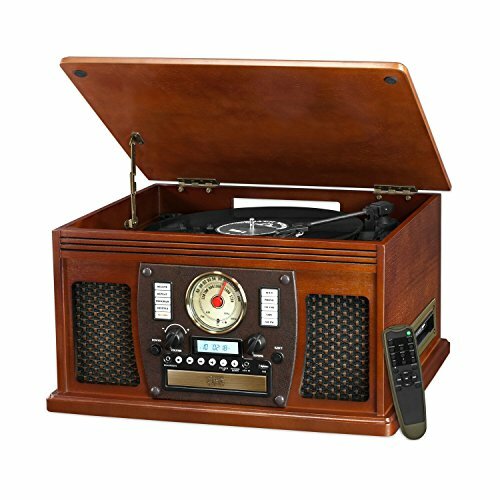 If you want something more budget friendly and that offers more bang for your buck, you cannot go wrong with the Victrola Nostalgic Aviator Wood 8-in-1 Bluetooth Turntable. 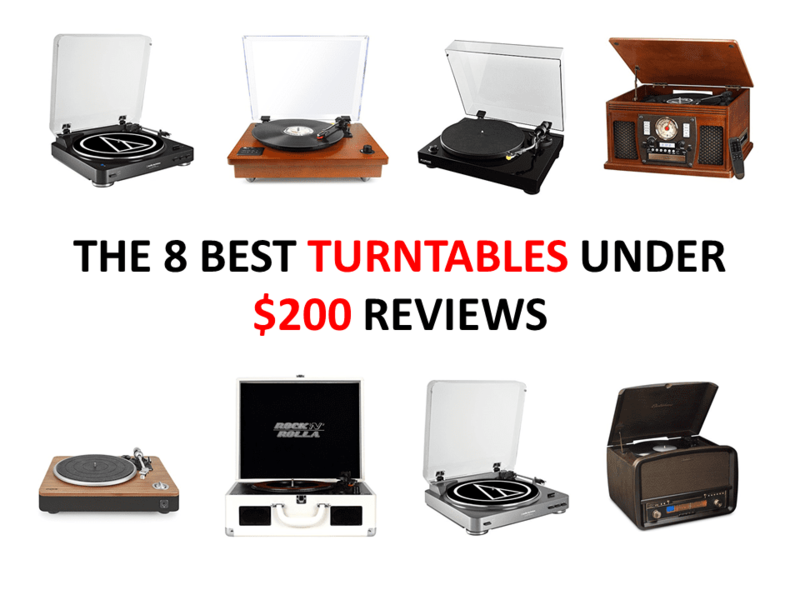 All of these are great so I am sure no matter what one you pick, you will see why these are all part of this best turntables under $200 list!